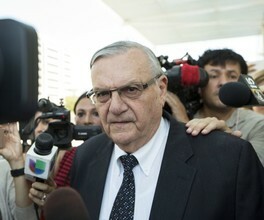 Yesterday, much to the pleasure of the left, Sheriff Joe Arpaio, the former chief law enforcement officer of Maricopa County, Arizona, was predictably found guilty of criminal contempt for allegedly profiling illegal immigrant Latinos at day workers sites — where else can you mostly find them — in violation of a prior court order, obtained by the American Civil Liberties Union, before a politicized judge, G. Murray Snow. I say predictably, because the federal judge who gleefully made the ruling holding "America's Sheriff" in criminal contempt, a buddy of Judge Snow, Susan Bolton, is — you guessed it — an appointee of former President Bill Clinton. Regrettably, as the founder of both Judicial Watch and now Freedom Watch, and as a former candidate for the U.S. Senate in Florida, I have fought my entire career to restore ethics, morality, and honesty to the legal system. I truly believe in the legal system and continue to fight for it tooth and nail. But sadly, this country, which falsely prides itself on being the most just in the world, is far from that.